Britain's newspapers are for the most part deeply hostile to the EU, and committed to making a success of Brexit. At the same time, they have created a narrative about the referendum result which casts it as a victory for the common man and woman against a liberal, metropolitan establishment that counts the mainstream media - whatever that now means - as its weapon of choice. This is one of the more pleasing ironies about the state of media in Britain today. A brief glance at this week's headlines gives ample evidence of what psychologists call confirmation bias - the tendency to interpret events in a way that accords with pre-existing prejudices. For papers who backed Leave, Theresa May's speech showed a stern commitment to freedom and love of country. 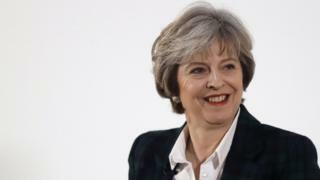 The Mail, Sun, Telegraph and Express, who between them have done most to advance the Brexit cause, lauded the prime minister's speech. The Mail has been a strong backer of May, seeing her as much the most plausible Tory leader in the aftermath of David Cameron's resignation, and contrasting her ostensible gravitas with the lightweights in her cabinet. Just for clarity, I'm paraphrasing the Mail's position there rather than mine, and doing so based on several conversations with the most senior figures there. Picture choices matter so much in newspapers. I must say I am a very big fan of cartoons on front pages, as this Charlie Hebdo front page from my previous job shows you, and the Mail's use of a cartoon to show the prime minister looking defiant in a way redolent of the Dad's Army title sequence achieves its desired effect. Similarly the Sun has her looking cheerful next to supportive furniture (the headline and sub-headline). Wednesday's front pages alone provide ample evidence of the way the same events are interpreted in wildly different ways by different newspapers - always and without fail in accordance with their prejudices. In some ways, Fleet Street, as romantics like me still sometimes call it, is basically the industrialisation of confirmation bias. Does that matter, when newspapers are in swift decline? Of course it does, and hugely so. Despite their perpetual shrinkage, newspapers are still read by millions of people across Britain. Moreover, they exert huge - some would argue disproportionate - influence on the news agenda of broadcasters like the BBC, Sky and ITV. And in my experience, Westminster is still obsessed, to a really bizarre degree, with trying to influence newspapers. This was perhaps understandable 20 years ago; but today, when fake news goes viral, it seem strange to me how much politicians care about headlines on page 17 of daily publications. And yet they do. Which is why the other important point about Fleet Street is that it is strongly weighted toward Brexit, and in that sense in touch with voters who, albeit by a small margin, voted to Leave. Most papers are delighted with the referendum result and support the prime minister. Given the sheer complexity of Brexit negotiations, it's lucky for Theresa May that, despite having backed Remain herself, she can generally count on Britain's newspapers to back her every move in Brussels. That is not a luxury many previous prime ministers have enjoyed.